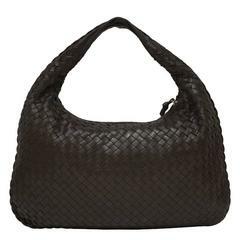 This Bottega Veneta Intrecciato Leather Hobo is no longer available. Dark grayish blue Intrecciato leather. Antiqued gold-tone hardware. Zip closure at top. Single flat top handle. Pleated accents at exterior. Brown suede lining. 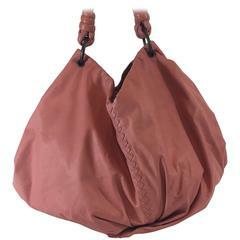 Dual pockets at interior walls; one with zip closure.